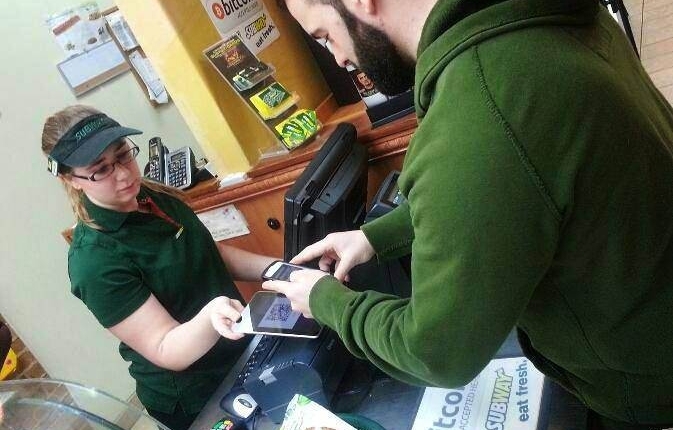 Editor’s note: Andrew Torba, a bitcoin fan, recently visited a Subway in the US and blogged about the experience. We thought his story about completing a real-world bitcoin transaction captured the thrill of using the emerging technology for the first time. Subway may have had similar feelings, as it since sent a tweet to its 1.6 million followers about the transaction, but this tweet has since been deleted. I’m a huge fan of bitcoin. For those of you who don’t know, bitcoin is a decentralized digital currency that is disrupting the way we exchange money on a global level. I’ve been following bitcoin for about six months now, but up until six weeks ago I never really dove in and learned what this mystical new digital currency actually was. After spending a countless number of hours researching, I ended up buying some bitcoin while it was still under $200. The more I understood, the more fascinated and passionate I became with the digital currency that was quickly gaining popularity around the world. On 12th November I was excited to learn that one of the first business establishments in the United States to accept bitcoin was located in my own backyard. I knew I had to make the 45-minute drive to be one of the first people to complete a real-world transaction with bitcoin. On a whim, my good friend and professional photographer Christopher Nash and I made the trip to Allentown, PA – home of the first Subway in the United States to accept bitcoin as a payment option. During the ride we spoke about the unbelievable potential bitcoin had to completely revolutionize global commerce and finance, which only heightened the anticipation to make our first purchase. 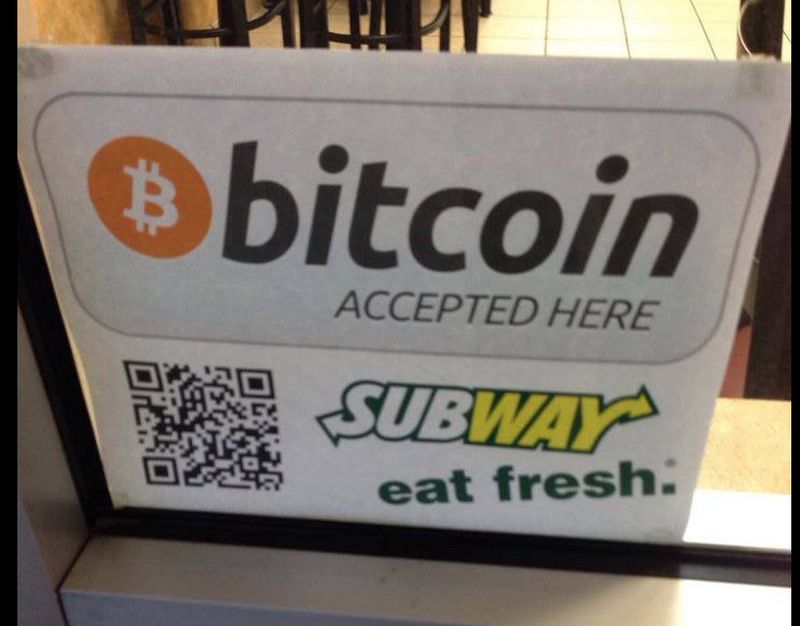 We pulled up to the small Subway shop on Hamilton Boulevard and proceeded to geek out at the sight of the bitcoin sign on the front door.“Bitcoin accepted here.” We wondered how many people walked by this sign on a daily basis and had no idea that they were stepping into history. After making a slight scene in front of the store and following some odd looks from employees and customers, we made our way to the counter and placed our order. While our sandwiches were being made we bombarded the employees with questions. They were cool about it and happy to help. I asked how many people had come in this past week to make a purchase with bitcoin. The employees looked at each other and told us that between them they have had well over one hundred bitcoin enthusiasts stop in during their short shifts alone. “Some told us they traveled four hours, and all they only bought a few cookies.” A wise investment, not only because Subway’s cookies are amazing; but also because next month the bitcoin they spent on food could well be worth double the value. That being said, transactions will be the backbone of bitcoin’s future. If you really want to support bitcoin’s long-term success, you need support bitcoin businesses by making purchases. Unfortunately due to the current volatility of bitcoin over the past year, many are choosing to sit on their investment and watch it rise and fall in value. What a crazy ride it has been. I hit send and within seconds she received confirmation on the iPad that her account had received the bitcoin. It took no longer than a credit card transaction, and it didn’t require my signature. Thankfully the business owner and I had the Coinbase app installed before Apple unexpectedly removed the app from the App Store less than a month after it was launched. This could be a blockade to bitcoin adoption in the US, hopefully Coinbase can get this issue resolved with Apple immediately. Perhaps after the recent positive Senate hearings, Apple will have a change of heart. Bitcoin surged this week to a new high of over $700 after US agencies told a Senate committee that bitcoin is a “legal means of exchange.” However, it’s important to note that adoption in China is also a major force behind this spike in value. After we finished our subs, we knew we had to make another purchase. 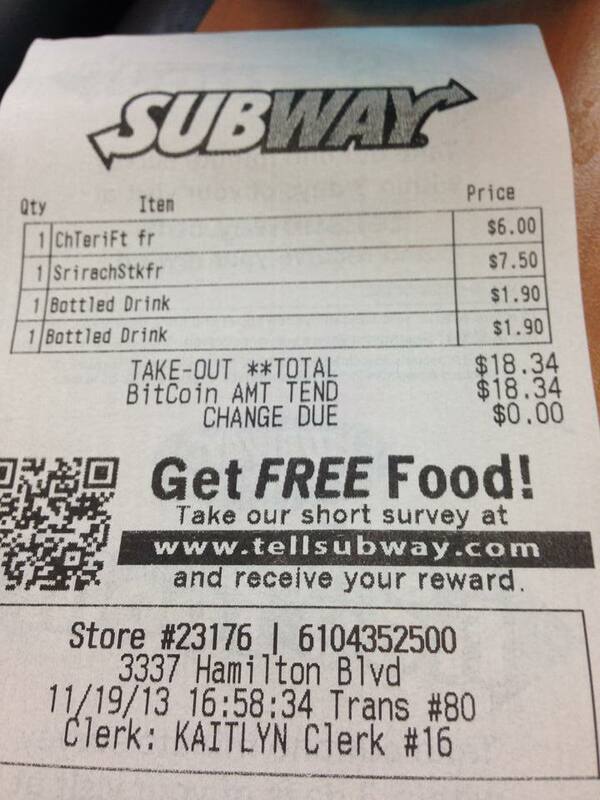 This time we opted for the cookies and even recorded a short Vine of the transaction. Chris and I weren’t as keen with our bitcoin purchase, but mainly because we were hungry. Ironically I forgot to bring any cash with me, luckily Chris had enough to pay the tolls on the Turnpike. Overall the experience was remarkable. A great story to tell the grandkids someday. Love it or hate it, you can’t deny that bitcoin is an exciting new technology that will undoubtably change the world. I am proud to say I played a small part of history in the making.